Goat Cheese made with goats milk provided by local dairy farms in Wisconsin. Goats milk cheese can be easier to digest for people who may be lactose intolerant. Blazing Billy is our Jalapeno infused Goat cheese. Grumpy Goat is an award-winning, bold, semi-hard, but still creamy, goat cheese, cellar-aged over 1 year for an audacious robust flavor. Mild Smoked Cheddar is made the same way as traditional cheddar, but with a couple of twists. 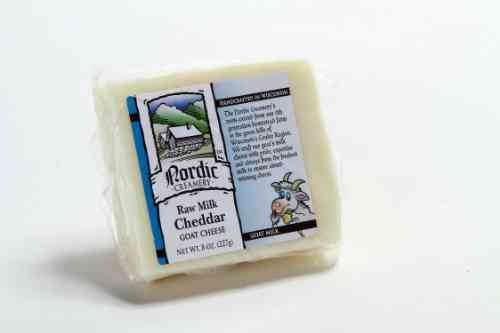 Mild Cheddar is made the same way as traditional cheddar, except we use the freshest goat’s milk. Jack Cheese made from fresh Goats Milk in Wisconsin. Service Area: Westby, Viroqua, Onalaska, Tomah, Holmen, West Salem, La Crescent, Fond Du Lac, Chippewa Falls, Waukesha, Wisconsin Rapids and surrounding communities.